A surface is a space in which movement is possible in only two perpendicular directions, as opposed to the three mutually perpendicular directions of the usual three dimensional space we inhabit. You've probably seen images of surfaces like the torus below and the Klein bottle to the right. Unfortunately such depictions have two major drawbacks: they suggest that surfaces are surfaces of something and that they lie in a larger, three dimensional space. Both of these are misconceptions. Imagine you are a cyclops. Not one of the Greek cyclopses, but a two dimensional cyclops, like the fellow to the right. In the course of this and the following sections, this will be your alter ego, so we better figure out how you perceive the world around you. Which object looks bigger, the triangle or the square? Now that we've established how you, lacking depth perception, see the objects around you let's see what happens when you're placed on a surface, for example the sphere. On a sphere, the shortest distance between two points is a segment of a great circle, the circle of the greatest circumference on the sphere, as pictured below. Just as light travels in a straight line on a plane, minimizing time traveled between any two points, so does light travel along a great circle on a sphere, again minimizing time. Don't forget that both your alter ego the smiling cyclops and the sphere itself have zero thickness, so that there are no sides to the sphere as such, only when we picture it in space as above. As the flat cyclops, you don't know what the third dimension is—much like we can't picture four dimensional space—and all your perception is confined to a circular, one dimensional horizon. Assume that the sphere has no fog or other atmospheric effects which absorb or distort light. If you wanted to examine the top of your head, would you look up or down? You're joined by a friend, who starts walking away from you in a great circle (bottom picture). What do you see as he walks away? 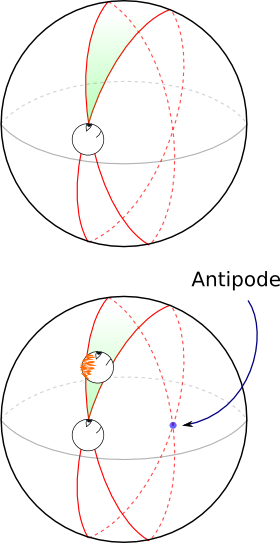 What do you see when he reaches the antipode, the opposite point to the one on which you're standing? When he passes it? At which points in his journey does he look to be furthest away (i.e. smallest)? What does he see as he walks around the sphere? Draw a few pictures to help you. Not for the claustrophobic, huh? Let's see what life is like on the torus, right after we figure out what a torus actually is. 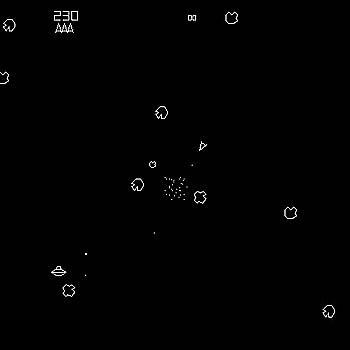 If you've ever played Asteroids, you already know what a torus is. In the game you control a triangular spaceship which moves vertically and horizontally across the screen. When it hits the left side of the screen, it emerges from the right at the same height and with the same orientation and velocity. Similarly, flying across the right side of the screen teleports you left, crossing the upper edge brings you to the bottom, and vice versa. Thus while the game takes place in a finite area, no matter which direction you fly, you never hit a wall or a boundary (and neither do the asteroids which you're supposed to blow up). A mathematician would say that the game is being played on a torus. 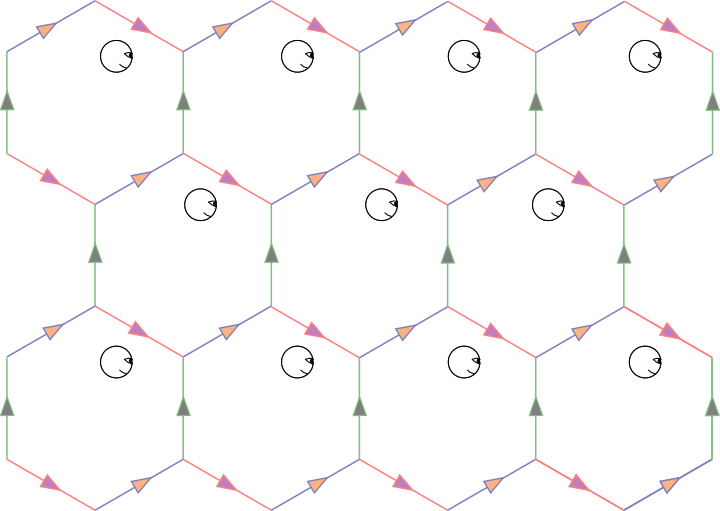 One way to represent this surface is by a square whose right and left edges are "glued", as well as its top and bottom edges. If you actually carry out the gluing, you'll end up with the familiar, surface of a donut torus. When I say torus, unless stated otherwise I mean the flat torus in the upper left hand corner of the illustration above. It's called flat because every piece of it looks like the plane, with a flat geometry. 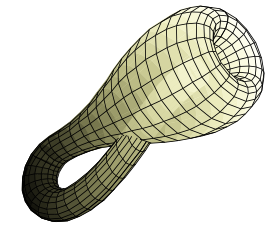 The folded, donut shell torus inherits a curved geometry from the 3-space it lies in. Its inside horizontal circle, for instance, is shorter than its outside horizontal circle. We'll talk a lot more about curvature and geometry versus topology a little later. 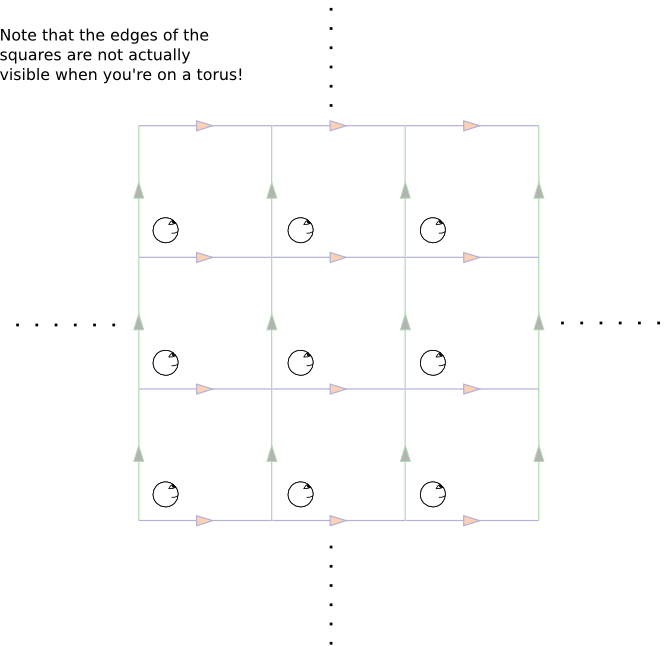 From now on, when you think torus, have the square with identified sides in your mind. Suppose you decide to run around. What do you see around you as you move? Here's a trick question: among all the copies of "you" that you see, which are real? 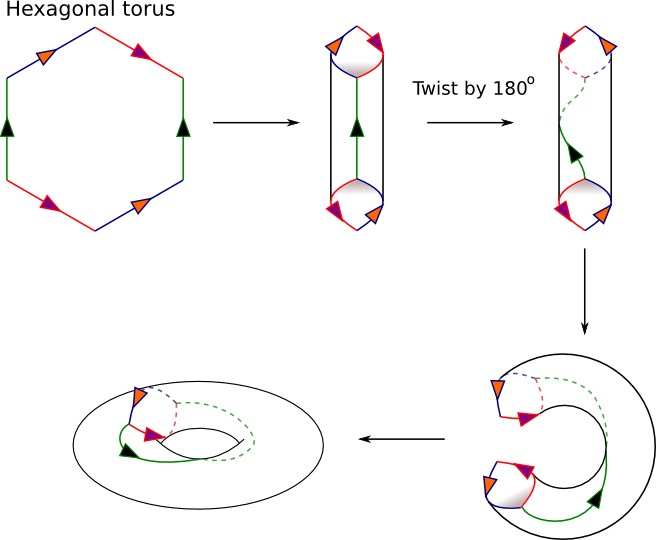 Another way to build a torus is to identify edges of a hexagon, as in the picture below. 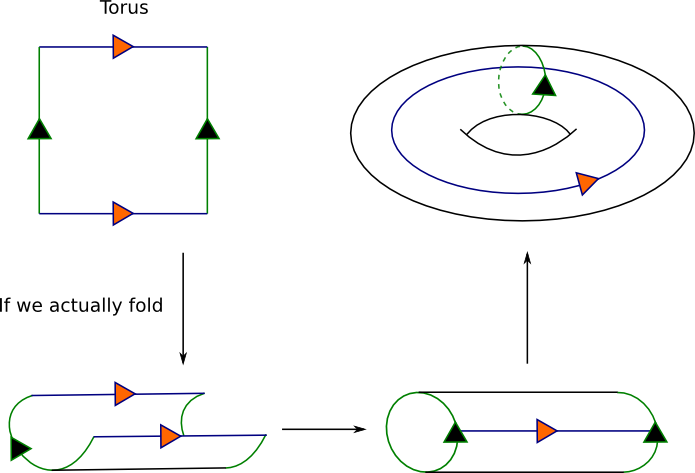 Topologically, it's a torus since by stretching and shrinking, we can deform it to the flat torus. However, it's geometry, the way things look from the inside, is not the same as that of a flat torus. How can you tell the difference between the square torus and the hexagonal torus, from the inside?